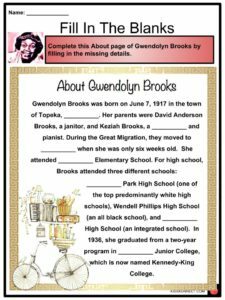 Gwendolyn Elizabeth Brooks was a well-known and influential African American poet, author, and educator. 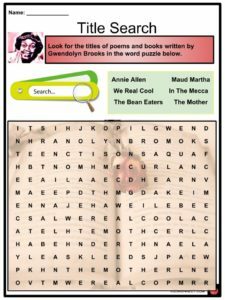 Gwendolyn Elizabeth Brooks was a well-known and influential African American poet, author, and educator. She was the first African American awardee of the Pulitzer Prize for Poetry. She was also the first Black woman to be a poetry consultant to the Library of Congress. 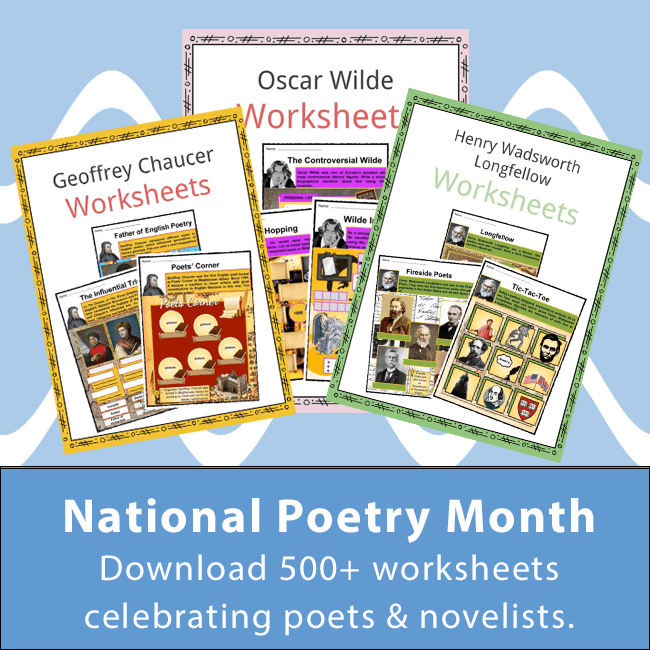 See the fact file below for more information on the Gwendolyn Brooks or alternatively, you can download our 24-page Gwendolyn Brooks worksheet pack to utilise within the classroom or home environment. 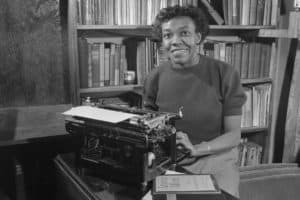 Gwendolyn Brooks was born on June 7, 1917 in the town of Topeka, Kansas. She was born to David Anderson Brooks, a janitor, and Keziah Brooks, a teacher and pianist. During the Great Migration, Gwendolyn and her family moved to Chicago when she was only six weeks old. She considers Chicago her home instead of Kansas. She attended Forestville Elementary School. 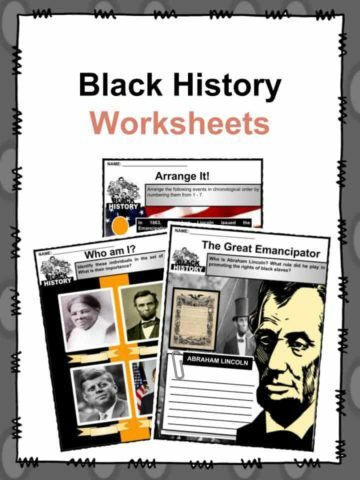 For high school, Brooks attended three different schools: Hyde Park High School (one of the top predominantly white high schools), Wendell Phillips High School (an all black school), and Englewood High School (an integrated school). At a young age, Brooks already started writing and knew she wanted to be a writer. She chose a two-year program over a four-year program in college. In 1936, she graduated Wilson Junior College which is now named Kennedy-King College. After graduation, she worked as publicity director for a youth arm of the National Association for the Advancement of Colored People (NAACP). Her first published piece was her poem entitled Eventide which got published in American Childhood, a magazine, when she was 13 years old. She began getting her poems published in the African-American newspaper Chicago Defender when she was 17. Her first collection of poems was entitled A Street in Bronzeville which was published by Harper and Row in 1945. As a poet, Brooks became associated with writers involved in the poetry journal Poetry: A Magazine of Verse from whom she received more encouragement to write. In 1943, she won the Midwestern Writers Conference Poetry Award. 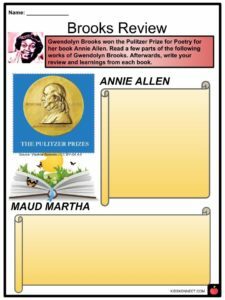 Her second poetry book Annie Allen, which was published in 1949, won her the Pulitzer Prize for Poetry. Annie Allen features the experiences of a black girl living in Bronzeville, Chicago and her journey to adulthood. American authors Richard Wright and Langston Hughes praised Brooks’ works. Maud Martha was Brooks’ first and only novel which featured 34 vignettes and was published in 1953. In the novel, Maud Martha was a girl who faced prejudices from white people and light-colored black people which Brooks had experienced herself. Her poetry style included, but was not limited to: ballads, sonnets, and free verse. 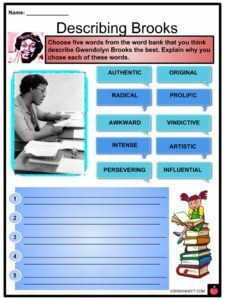 She drew inspiration for the characters in her poetry from her urban neighborhood and from an African American perspective. Her work in the 1960’s mostly consisted of themes surrounding the current social and political climate of civil rights activism. In 1962, she was invited by President John Kennedy to read at a poetry festival at the Library of Congress. In 1967, her style shifted when she decided to be more involved in the Black Arts movement. Her work had always included elements of exposing social issues but her later work had a more intense and apparent tone of protest. She published two more collections of poetry: Bronzeville Boys and Girls in 1956, and In the Mecca in 1968. 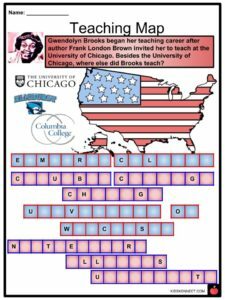 Brooks was invited by author Frank London Brown to teach American literature at the University of Chicago which was her first experience in teaching. 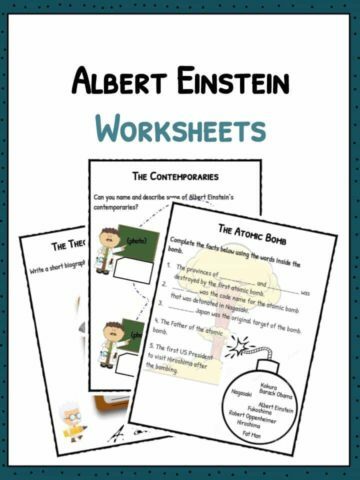 She then taught poetry and writing to a lot of universities such as Columbia College Chicago, Columbia University, Clay College of New York, Elmhurst College, University of Wisconsin, and Northeastern Illinois University. Brooks had also been active in poetry workshops. She was a poet laureate of the State of Illinois. As a poet laureate, she worked to make poetry accessible to the public. In 1976, she was inducted into the American Academy of Arts and Letters. In 1988, she was inducted into the National Women’s Hall of Fame. In 1995, she was awarded the National Medal of Arts. Buildings and institutions were put up in honor of Brooks, such as the Gwendolyn Brooks College Preparatory Academy in Chicago; the Gwendolyn Brooks Cultural Center in Western Illinois University; and the Gwendolyn Brooks Center for Black Literature and Creative Writing in Chicago State University. In 1939, Brooks married Henry Lowington Blakely, Jr.
She had two children with Blakely namely Henry Lowington Blakely III and Nora Brooks Blakely. Gwendolyn Brooks died on December 3, 2000 at age 83. 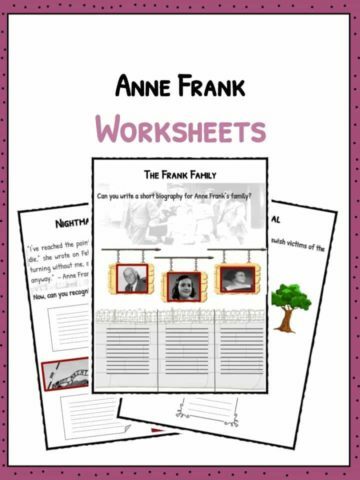 Her autobiographies Report From Part One and Report From Part Two were published in 1972 and 1995 respectively. 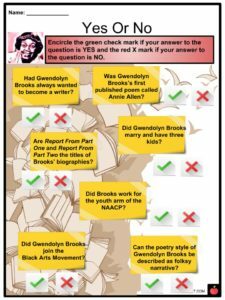 This is a fantastic bundle which includes everything you need to know about Gwendolyn Brooks across 24 in-depth pages. 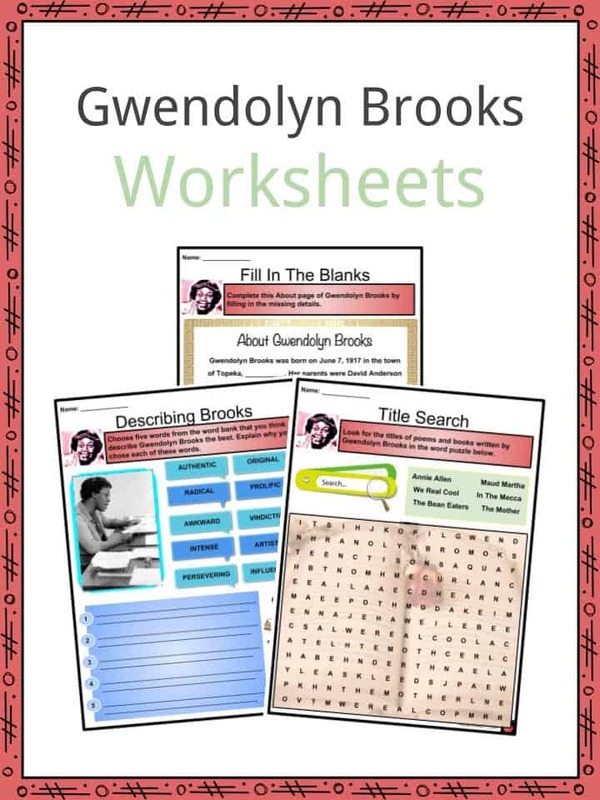 These are ready-to-use Gwendolyn Brooks worksheets that are perfect for teaching students about Gwendolyn Elizabeth Brooks who was a well-known and influential African American poet, author, and educator. She was the first African American awardee of the Pulitzer Prize for Poetry. She was also the first Black woman to be a poetry consultant to the Library of Congress.